Chip Yates is making a return to electric motorcycle racing for the 2013 Pikes Peak International Hill Climb, riding in the saddle of a Lightning Motorcycle superbike. The press release sent by Chip Yates describes it as a an electric head-to-head battle between Yates and 6-time Pikes Peak motorcycle champion Greg Tracy (#555). While Yates' stead in this challenge is a Lightning Motorcycles superbike, the stead chosen by Tracy is Amarok's electric superbike. During his brief career in electric motorcycle racing, Yates set a record for electric motorcycles in the 2011 Pikes Peak Hill Climb. On the paved section of the course, his rookie split times landed him 9th overall among 112 motorcycles before the ensuing 2.6 miles of bumpy dirt roads in the middle of the course slowed his final result to a 12:50.094. The course is now paved all the way to the top of the mountain. We need a little divergence into history of the 2011 season. 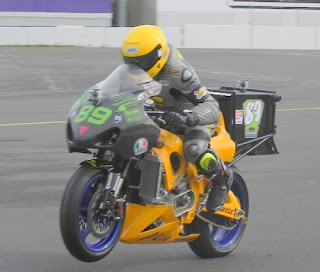 Yates had built his electric superbike and raced it in a few events during 2011, racking up impressive performances. At the Bonneville Salt Flats he set a 196.420 miles/hr land speed record. While that's impressively fast, a speed that has never been beaten since, and was 20 miles/hr faster than the 2010 record set by Lightning Motorcycles, it did not beat the 215.96 miles/hr record achieved three weeks ago by the Lightning Motorcycles team. This is what Yates referred to. The electric vehicle field at the Pikes Peak event is shaping up to be a big deal: Ted Rich has joined a team being organized by Hollywood Electrics, with Zero Motorcycles and Hollywood Electrics directly collaborating to support riders on Zero Motorcycles bikes, including Jeremiah Johnson, and several electric cars and motorcycles are on the roster.